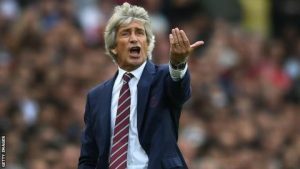 »News»Poll: Has Pellegrini lived up to your expectations? Poll: Has Pellegrini lived up to your expectations? Hammers fans were in a state of high excitement when Manuel Pellegrini arrived in the summer followed by £100 million plus expenditure and a host of new players. Sir Trev, however, was among those who warned that it would take at least three years for the team to reach that much mentioned top level. Now as we turn into the final part of the season the Hammers are sitting in 10th place despite a host of injury problems for much of the season. It has been a season of the highest highs and the lowest of lows and no we aren’t going to examine them again but there’s a question which needs answering by the fans and it is the subject of today’s poll. Our question is: Has Manuel Pellegrini’s brand of management produced the season you would have expected – has it lived up to your expectations? Has Manuel Pellegrini’s brand of management produced the season you would have expected -has it lived up to your expectations? Yes – integrating that number of new players and coping with the ludicrous injuries we have had, he has done well. I do, of course expect much better next season once he has had the summer to sweep out the old and bring in more new.